Label can be a part of another element (such as chart, legend, axis, etc) or it can be used independently. Minimal and maximal font sizes can be configured using: anychart.core.ui.Label#minFontSize and anychart.core.ui.Label#maxFontSize. Note: Works only when anychart.core.ui.Label#width and anychart.core.ui.Label#height are set. Note: anychart.core.ui.Label#fontSize does not work when adjusting is enabled. anychart.core.ui.Label - Self instance for method chaining. Getter for label anchor settings. 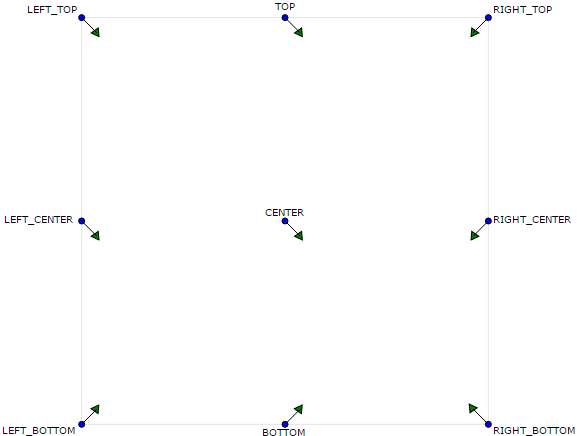 Setter for label anchor settings. Note: merges label positioning point (anychart.core.ui.Label#position) with an anchor. Note: By default background is disabled. Set enabled(true) to start working with it. anychart.core.ui.Background - Returns the background settings. Note: works only when adjusting is enabled. Look anychart.core.ui.Label#adjustFontSize. See how paddings work at anychart.core.Chart#padding. Setter for the label padding in pixels by one value. Setter for the label padding in pixels. Getter for label position settings. anychart.enums.Position | string - Label position settings. Setter for label position settings. Note: works only if anychart.core.ui.Label#container or anychart.core.ui.Label#parentBounds are explicitly set. Getter for the label rotation. Setter for the label rotation. Getter for the text content for a label. string - Text content of a label. Setter for text content for a label.